Art Specially for Swap lovers……. The new book is in production and should be out in two weeks’ time – woohoo! Can’t wait to see this one and some of my friends/fellow group members have their artwork published in this one, so all the more exciting. Here’s a sneak preview of the cover…….. It will be shipped to us as soon as it’s available, so watch this space. I can’t recommend these books highly enough – especially the Techniques book (currently sold out and new stock on the way) which is beautifully produced and laid out, gorgeous artwork inside and really helpful information, with a great glossary and step by step instructions for some great techniques, as well as some fab projects. You can see one of them here – it’s the book that Lynne did at the last workshop! This is a photo of the real cover – duh, I boobed – again! Just to show how sad I really am, I’m uploading photos of two of my friends. I really mean it, too! I spend hours talking to them and putting out food for them, but am rewarded when, like here, they come to our feet for food. 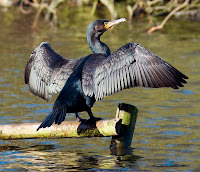 I have to be honest and say that it only usually happens at breeding time – after that they start to lose feathers and become very timid because they aren’t as confident of their aerobatic skills. The downside is that I sometimes get up to a death bed of feathe rs in the garden. The sparrowhawks are rampant around here because they know they have easy targets. I’ve found two blackbird graves in the last two weeks and I cry when I do. I need to get a photo of my favourite bird, Scruff. We nicknamed him that when he turned up at the front of the house one day, looking absolutely battered and with one leg which wouldn’t bend. We spent the next couple of months feeding him at the front – he’d wait for us to come home and then come dow n as soon as we put food out, knowing that the other birds would leave him alone if he came while we were there. 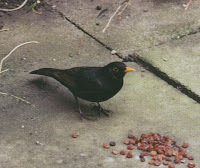 Then he started taking sultanas off with him and we knew he had babies. He brought them to meet us when they fledged – it was lovely. Wh en I saw the first blackbird grave, I seriously feared for him because of his leg, but he comes every couple of days and the day before yesterday, he actually came down while I was there, much to my delight. They’ll become less timid as it gets colder and they need the food more. Photos courtesy of John, not me. 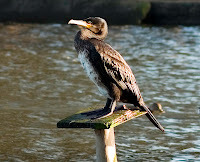 To show how good he is, here are a couple of his cormorant photos and one of a grebe. The others were taken with an SLR but this is taken with his new Digital. Holiday’s over and now it’s time to work again, so I’ve been busy with shop stuff. But the other day I started to play with something I’ve been fancying for a while and I just finished it off. Remember that silver plumbing tape Tim Holtz used in his video? I’ve been playing with that. I attached some to a piece of card, then used a stylus tool to create a grid type effect, added Alcohol inks in Lettuce, Stream and Meadow, then overstamped it. The main image wasn’ t too clear, as I expected, so I stamped the same image on acetate and overlaid it, attaching with metallic brads, to fit in with the metallic theme. It’s not brilliant but it was fun. Unfortunately, I allowed myself to cut with (shock, horror!) scissors, so nothing’s really straight. Back to work………..
Would you believe this is a private waterfall? How cool i s that? We noticed it as we were driving home from Harlech and stopped to have a look, but then realised there was a Private sign on the fence. I couldn’t get any closer to take a photo. You could get to it a little further up, on a public footpath and bridge, but it was the back of the actual waterfall. This is the view from the back – still gorgeous, but not quite the same! This is one of John’s photos of Harlech Castle. Of course he was sensible enough to take a wide an gled lens for his posh camera 🙂 I’m left with his rejects to use! Words ATCs made for a swap. I think the floral one needs more, so that will probably change, but I still like that effect. The background is one of my ‘mop ups’ from making Inky backgrounds on a non-stick craft mat. The other one is from the Yellow masterboard I made with gesso and inks for the Yellow Inchie swap. I just added more words and a few more colours of ink. We finally had good weather, so this morning we took off to Ruthin in North Wales for breakfast. We went to an old café John used to take me to on Sundays – one of his biker haunts – we went camping up there when we first met, to a place called Bontucle. Gorgeous views up in the Welsh hills – or is it mountains? We decided they must be hountains, hybrids of the two. I really wanted to stay and to go hunt around the shops in the village, but we had to get back so I could get the current issue of Cloth Paper Scissors and Artful Blogger out in the mail. Anyway, here’s a couple of photos of the view from the road. I’ve been quiet, but that’s mainly cos I’ve been stamping for a change. We did a demo for a Stamp Club last night and I had prep to do. I’ll upload all the samples to the website, but you can see a few bits here. I was demonstrating the Adirondack Dabber resist technique and used Distress inks (Dried Marigold) and Adirondack Brights (Pool) on the envelope book. On the Tag book I used Adirondack Citrus, Pool and Purple Twilight on the covers (inspired by Godelieve Tijskens). I’m still in love with the Tim Holtz unmounted stamps and I’ve also used the Time to Stamp Birds plates on the Tag book, plus Simple Expressions stamps.